I joined Twitter today, FINALLY, and found all sorts of fabulous things on the worldwide internet web. For starters, here's a recipe that could be a Thanksgiving coup! 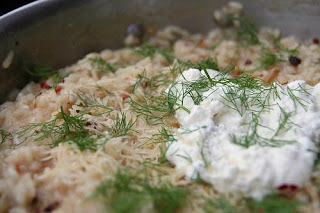 Check out Feelgood Eats, a food blog written by Natural Chef Sue Bette, which today features a recipe for fennel & chili risotto. YUM. Oh, and I'm still figuring out this Twitter thing, but if you'd like to be friends in a character-minimal fashion, I'm @TheYumDiary! I'm going to try and keep the Twittering to food and leisure topics, but it's hard to resist posts like the live puppy cam I found thanks to a tweet by food doyenne Sam Breach of Becks and Posh! Her latest blog post, btw, is a lovely before/after photo of her and her mate's garden plot at Alemany Farm. Lush beanery! Here's the link to that puppy cam. I spent all day with these six snuggly pups today, you know, just minimized over in the corner, all wriggling and nipping and snoozing and puppy sighing. Every once in a while I'd have a maxed screen covering the feed and I'd forget about them, and then I'd hear this faint rustling and light yipping. And I'd discover them ALL OVER AGAIN!! ALL PUPPIES ALL THE TIME!! Thanks, Twitter. Being a nerd just got a whole lot more complicated.